Hosted by the BRDC and organised by Sir Jack’s youngest son, David, the Memorial will provide an opportunity for those who were unable to attend the state funeral in Australia to reminisce and pay their respects. Sir Jack, the legendary driver and engineer who passed away in May, suffered from kidney disease and underwent dialysis for many years. He was renowned for his tremendous contribution to raising awareness of kidney disease, particularly in Australia. 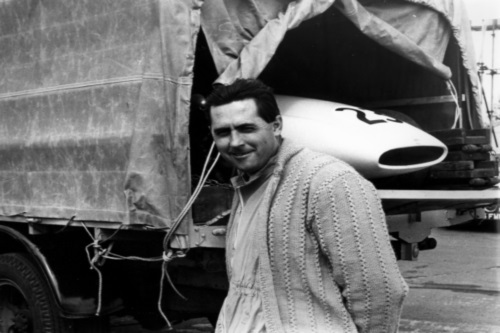 In the hope of continuing Jack’s efforts, the Sir Jack Brabham Memorial will raise funds for Kidney Research - the only UK based charity dedicated to funding research to create a world free from kidney disease. The afternoon of celebration will feature stage interviews with a number of Sir Jack’s friends and racing colleagues including special guests Sir Stirling Moss, Sir Jackie Stewart, John Surtees, Tony Brooks and Nick Goozée. Sir Jack’s widow, Lady Margaret will be flying over from Australia while Geoffrey and Matthew Brabham will make a special trip from the USA to attend. Guests will also have the opportunity to enjoy seldom seen film footage and some of Jack’s treasured personal artifacts. A stunning array of Brabham cars will be on display, charting not only Sir Jack’s remarkable racing history but also the Brabham marque’s rise to becoming the biggest racing car manufacturer of the 1960s. Adorning the Silverstone Wing will be a Cooper-Climax T53 signifying Jack’s second Formula 1 World Championship in 1960; the first Brabham F1 car ever built in 1962 - the BT3; the BT11 – a predecessor to the 1966 world beating BT19; the BT20 in which Sir Jack completed his ’66 championship year; a Brabham BT24 from 1967 and Sir Jack’s final F1 car, the Brabham BT33 in which he took his last Grand Prix win in South Africa 1970. Completing the collection will be also a Brabham BT6 Formula Junior car and BT8 1964 sportscar. The motorsport fraternity and Sir Jack’s fans alike are welcome to be a part of this special event, attendance for which is limited to 600 people. To request a ticket to attend, please contact Deborah Jennings at deborah.jennings@brdc.co.uk or call 01327 850 925.